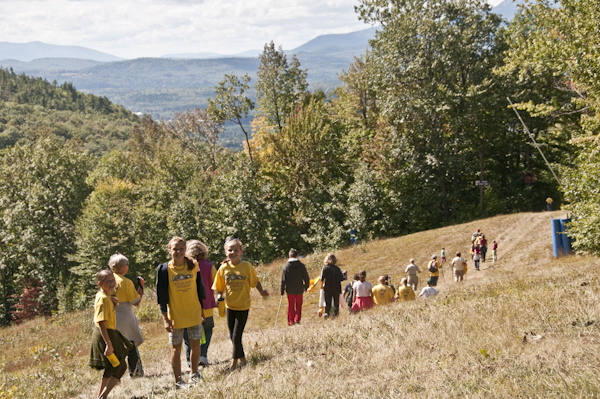 The Climb Against Cancer is an annual event held in September at Cranmore Mountain Resort. It has become symbolic of the hurdles that cancer patients, survivors, and their families must overcome to win the battle against cancer. Many people participate to celebrate survivorship; others come to commemorate the lives of those who lost the battle with cancer. And still others hike to raise money for their friends and neighbors who are being helped by Jen’s Friends. People of all ages participate, and many bring their four-legged family members. The hike up and down the slopes of Cranmore Mountain is approximately three miles. Participants may choose to hike the entire or partial route. Those who hike to the top of the mountain will be rewarded with picturesque views of Mt. Washington, the Presidential Range, Mt. Chocorua and the Moat Mountain range. They will also be entertained with live performances by local singers and dancers. Snacks and water are also provided. After the hike, participants are treated to lunch and more live entertainment. Awards and prizes are also given out to the teams and individuals who raised the most money. Thank you to everyone who helped make the 2018 Climb Against Cancer a huge success! Together we raised over $87,000 to help support those in our community in their fight against cancer!